The proposed 00-99 digital counter becomes very handy in places where you need to keep the people organized in some specified order. As may be referred the circuit employs the popular 555 IC to genearte the pulse clocks. The pulse counting is done with the help of SW1. A couple of CMOS ICs 4026B respond to these clocks and become directly responsible for running the 7-segment display. Since the last digit is restricted to 99, the first 4026 activates the second, when it crosses from 9 to 0. 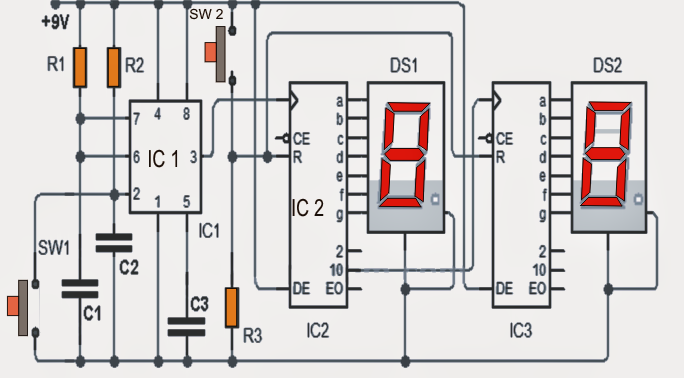 (see the pin 10 of the first 4026 that enters the clock input of the second). When the circuit is first powered, it may not start its count from a zero, so a momentary reset activation becomes necessary and is implemented using the switch (SW2). Pressing this switch the account resets the circuit and starts the count from zero (00). It may be interesting to see that a pulse is applied to pin R "RESET" in each integrated circuit.